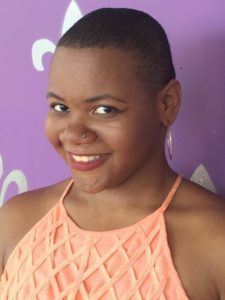 Maria Simpkins is a Detroit-based artist and TPE alum who uses verse, spoken word, dance, and theater to create ensemble-based activism works. With TPE, she has assistant directed/choreographed Twelfth Night, The Great War, The Bourgeois Gentleman, and The Women of Troy, as well as tour manager for this past summer’s Merry Wives of Windsor. Her theater company, Omphalos Symptom, creates improvised comedic scenarios or takes classical works and reworks them to address topical issues. She was a performer, writer and choreographer for the sold out show Speak Up, Speak Out with The Detroit Actors Theater Company. She and the show will be returning to Detroit for its remount this spring. She is a founding member of the Young Fenix Artist Collective and the Demere Collective. With Demere, she wrote for and choreographed its premiere and 2nd show of its new series, Poetry in Motion. Most recently, she finished her 2nd run of For Colored Girls Who Have Considered Suicide When the Rainbow is Enuf at the University of Michigan, which she directed, choreographed and performed in. Trained at Wayne State University, Maria has been acting for 13 years, dancing for 12, and directing for 8. She is a classically trained ballroom and flamenco dancer with 5 years of hip hop and freestyle experience. She and her former hip hop crew Syncz performed at the Detroit Pride Festival’s 2nd stage twice and have featured as backup dancers for various artists in and around Detroit, as well as performing at the Detroit Dance City Festival.